press release 2018.10.05 - ZYLIA PORTABLE RECORDING STUDIO. MULTI-TRACK MUSIC RECORDING WITH ONE MIC. 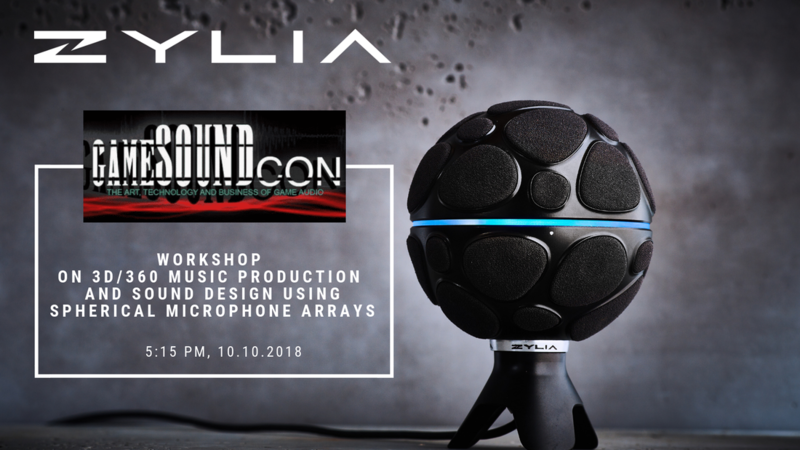 Zylia, the Poland-based manufacturer of audio recording technologies, will host a workshop on 3D/360 music production and sound design during GameSoundCon, Oct. 9-10 at the Millennium Biltmore Hotel in Los Angeles. Zylia Co-founder and CTO Tomasz Żernicki will lead the workshop, focusing on the use of 3rd order Ambisonics spherical microphone arrays, such as that in the innovative new ZYLIA ZM-1, to capture a 3D full-sphere audio scene for games or ambient sound production. During the Zylia GameSoundCon workshop, Zernicki will demonstrate how just one spherical microphone array can record an entire 3D sound scene and then separate the recording’s individual sound sources for multitrack editing in post-production. The numerous physical microphone capsules within the spherical array effectively enable users to work with software-controlled virtual microphones with adjustable direction and spatial characteristics. By isolating particular sounds, cutting out interesting areas of the sound space, and zooming in on particular sound objects, this kind of sound representation allows for soundscape modification in post-production and simplifies ambient or Foley sound preparation. Zernicki will explain how sound recorded by 3rd order Ambisonics spherical microphone array can be converted into the Ambisonics format and used in 360 movies — particularly virtual reality content on Facebook 360, YouTube 360, or game engines — in which listeners can rotate the whole sound scene. He also will discuss usage of 360 sound with the combination of binaural or surround loudspeaker reproduction. As an audio expert, Zernicki focuses his professional interest on 360/VR music production, spatial sound processing, and recording. He holds Ph.D. degrees in electrical and electronic engineering, and he takes an active role in the Moving Picture Expert Group (MPEG) standardization committee. He also has made significant contributions to audio compression standards such as MPEG-D USAC and MPEG-H 3D Audio. GameSoundCon is dedicated to game music, sound design, and virtual reality audio. Throughout the conference, Zernicki and other Zylia experts will be on hand to discuss 3D/360 sound applications, as well as the company’s ZYLIA ZM-1 spherical microphone array, ZYLIA Studio PRO VST/AU plug-in, and ZYLIA Ambisonics Converter.